Here’s the newspaper article, just for fun. Parasites or no, Ophelia has a very strict schedule. She really needed to get to… somewhere. On a bus. I feel like even “potentially dangerous” parasites appreciate those who provide shelter from the storm – Ophelia’s going to be just fine! 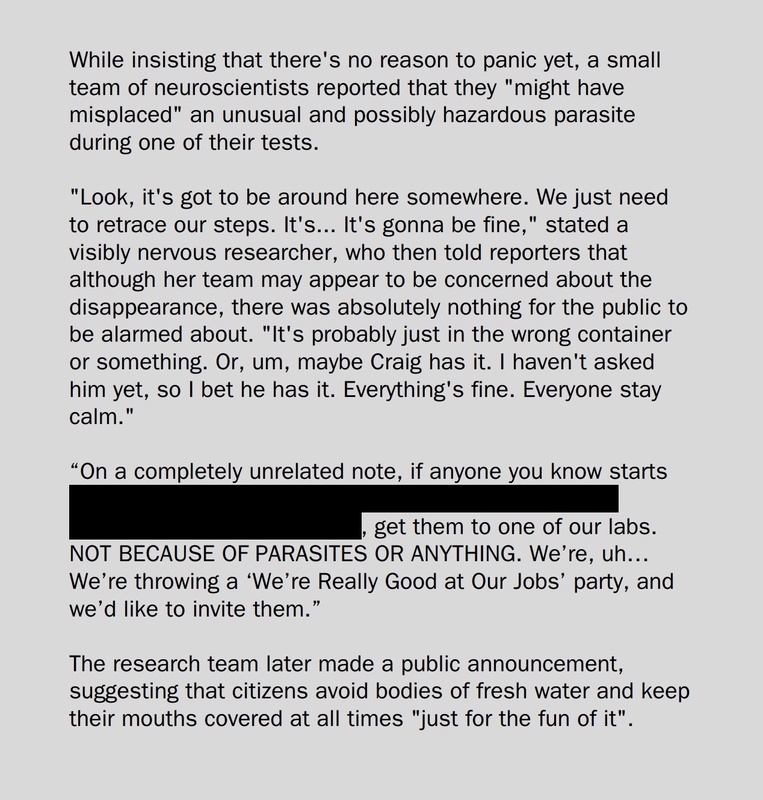 Maybe the “potentially dangerous” thing is just a ruse because the sweet little critter actually holds the key to cold fusion or telepathy…. It IS pretty cute for a “dangerous” parasite, isn’t it? But, to be fair, that could just be an evolutionary tactic to get potential hosts to let their guards down. Like to a zombie convention? Oh! When you said “cerebral gnawing”, I thought you were talking about the parasite, not her. I imagine she’d just feel anxious around all those other zombies and leave. Last time she went to a party, things got weird. Amazing droplets, especially on the zoomed bug.